Not just a singer with a refined and powerfully soulful voice, but a songwriter with a passion for spreading a message of love and acceptance, Kyndle McMahan is taking her talents to the center of the stage as a solo artist for the first time with the recent release of her fearless debut single "Pride." "Pride" which was released on April 13th, does not hold back in any form or fashion. From the belted vocals to the lyrics "get on board or get out of the way," Kyndle's debut single is one of empowerment, resounding with relevance and refusing to tolerate discrimination. "Pride" stakes Kyndle as an artist who is unafraid to speak her mind and love herself and others unapologetically . As an Emerging Star and alumna of The Consortium MMT's SoulRight Music Mentorship Program, we wanted to catch up with Kyndle to find out more about the brazen belter from Bolivar, Tennessee and her plans for her upcoming solo album. Talent Development Complex: What all have you been up to since The Consortium MMT? Since being in The Consortium MMT, I have graduated college at the University of Memphis. I have also sang background for Stevie Wonder, Ray Parker Jr., and William Bell, as well as honor the Memphis Horns at the 2017 Memphis Music Hall of Fame Ceremony. The MAIN thing I've been doing NOW is writing/recording with my producer Paul Ebersold and Adam Gowdy. In addition to working on my material we are working with other artists, developing them, writing/producing their songs, etc. With these most recent endeavors, I really feel like I'm investing into a pretty solid future. It feels good! Kyndle McMahan performing at 'New Faces Nite' in Nashville, Tennessee. Photo by Adrian Berryhill. TDC: How old were you when you began singing and performing, and what was your first public performance like? I started singing in church at the age of 4. Both my mom & my dad also sing and play instruments, and, at the time, when we weren't at our church we would travel, playing for churches all over the mid-south. That was my life for about 15 years. I didn't really "open up" about my voice until I was in high school. There, I started singing around town and competing in talent shows. I even directed/choreographed AND performed the lead role of Dorothy in my high school's production of "The Wiz". I then auditioned for Sound Fuzion at the University of Memphis and got in, which inevitably made the college decision for me since it was a full ride. From there I joined the music business program and naturally networked my way into various opportunities that sent me in the direction I am now. I met Jon Hornyak, who asked me to be a part of the Memphis Ukulele Band and also introduced me to Paul. I found a tight knit group of musicians/friends who I still play with today called the Bluff City Soul Collective. I've also been fortunate enough to be a part of various cover bands around town to help me make a living as I pursue a solo career as an artist. TDC: You have a lot of energy when you perform. Are there any particular singers or entertainers that you draw inspiration from? I'm naturally an energetic, incredibly enthusiastic person. Lol. You pair that with a passion, like singing and performing, and it's over! So me, myself, I'm just like that. Now honing in that energy and being intentional with every movement and every breath, I definitely look to the greats. Michael Jackson. Beyoncé. They're INCREDIBLE performers who know exactly what to do on a stage to hold the crowd with almost unwavering energy but also can make it through a 2 hour performance without compromising their talent. They've found that balance. As far as voices I look to Aretha Franklin, Robert Plant, Jill Scott, etc. Heartfelt emotion. Articulate phrasing. Nothing gets lost in translation. They just SAY it, and your body knows exactly what they mean! TDC: You just released your first single titled “Pride.” Can you tell us a little bit about this song and how it came to be? "Pride" is the first fruits of our labor! I spent an entire summer in Nashville with Paul in the studio before my senior year of college. He had this groove; very simple, very Chaka Khan. We hadn't a clue what meanings we were going to give this music but we decided to let it come to us naturally. One day, I woke up at 6 am to go to Nashville Pride, which was going to be proceeded by a march around the square. During this march, my heart was moved to tears, as the shootings in Orlando at Pulse nightclub had just happened. The magnitude of every single person's presence in being there was VERY real and VERY relevant. I felt love and acceptance all around me. I was so inspired that the next time I saw Paul I shared this experience with him. And at that moment, "Pride" was born! TDC: You are one of the Emerging Stars of The Consortium MMT’s SoulRight Music Mentorship Program. What was it like studying songwriting under the mentorship of David Porter, and has that experience helped you in writing this new record? 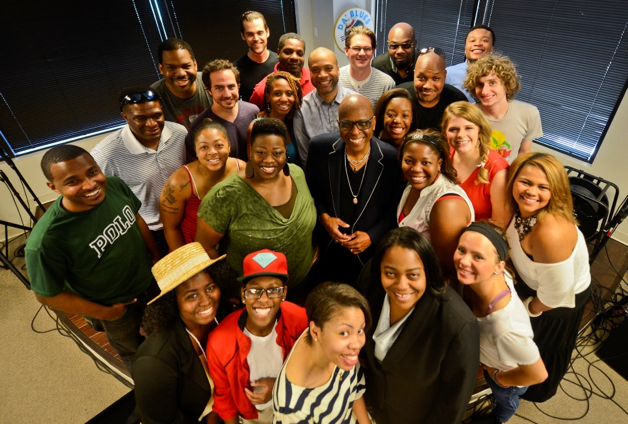 Kyndle in the bottom right corner at The Consortium MMT during the SoulRight Music Mentorship Program in 2014. I couldn't have come into the Consortium MMT program at a better time. I was very young and impressionable in my artistry. I was looking for something to sink my teeth into, and there the program was. Being mentored by David Porter as a songwriter is a luxury not everyone gets the opportunity to indulge in. I felt very honored to not only have been a part of the program, but to be selected as an Emerging Star. I truly believe the Consortium MMT helped me take those next steps to becoming the great songwriter I aim to be! TDC: What have been some of the challenges of pursuing a career in music and how has Memphis helped you along the way? I find the biggest struggle is staying motivated to perform those very mundane, unromantic tasks that are crucial in moving you from point A to point B. So updating my website, making sure there's consistent marketing across all social media platforms, drafting newsletters, making phone calls and responding to emails, etc. Since I thrive on being organized and "getting s**t done", I do enjoy completing these tasks. But when the return on all the work you've done is not what you expected or hoped it would be, it can be very demotivating. With that being said, I have found some of the most supportive, easily accessible people in Memphis who are down for the "cause" and genuinely want to lift the creative community up. Ben Yonas and the MUID program at the University of Memphis is a strong foundation I will always stand upon. If not for them, I'm positive I wouldn't be the person I am today. Garry Goin is the best MD in town! I don't care what anybody says! Lol. He conducts himself so professionally and he truly believed in me and my talents from the start. And for that, I am grateful! TDC: Where are you performing next, and how can we stay up-to-date with your career? TDC: And lastly, just for fun: I think you said once that if you weren’t writing and performing music, you would want to do musical theatre. Is that true? If so, why and what is your dream role? Musical theatre has always been a dream of mine! At the same time, I wanted to do theatre because I didn't think I could be an artist. And here I am now completely contradicting that. Lol. I still want to perform in musicals, but I see that being a "10 years into my career" type move. In addition to musical theatre, I see myself writing, directing, and starring in my own plays and movies. Will I do it? Only time will tell. Do I still WANT to do it? Hell yes!! Listen to Kyndle on Spotify or iTunes.